Nico... Maybe?. 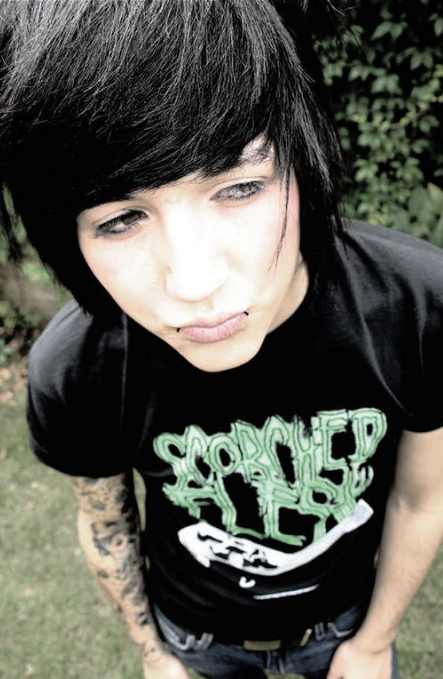 Well this guy kind of loks like the Nico I pictured in my mind (minus the tats and peircings) What do u people think?. Wallpaper and background images in the Nico di Angelo club tagged: nico percy jackson & olympians photo. Well this guy kind of loks like the Nico I pictured in my mind (minus the tats and peircings) What do u people think? This Nico di Angelo photo might contain jersey, t-shirt, t shirt, tee shirt, and trui. For a start, that guy looks emo... NICO IS NOT EMO! That guy's like, 18... NICO IS 12! That guy has piercings and tatoos... NICO DON'T HAVE TATOOS OR PIERCINGs! PLUS HE'S TO YOUNG FOR TATOOS ANYWAY!! Nooooooooooo, THIS IS NOT NICO!!! And I feel like Nico should have a pomagranite addiction, being a son of Hades...I mean...THE POMAGRANITE IS HADES SACERED FRUIT!!!!!!!!!!!!!!!!!!! The emo guy who wears makeup, has tattoos, and piercings? -.- Because he's the son of Hades? Ugh. Son of the dead means emo to you? @Flowerma Ha! Tattoos and piercings mean emo to you? Did you not read the description? It says right there in the parenthetical statement--and I quote--'minus the tats and piercings'. You have made yourself quite angry for no reason. I was referring to the dark hair and olive skin when I said this is how I imagined Nico in my mind. No need to be angry. Oh and Nico is not the son of the dead. He is the Prince of the dead. :) Have a nice day.